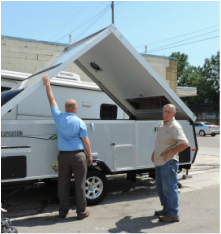 Picked up our new Aliner Expedition camper on Aug 16, 2013. Will be making the solar modifications in the spring before we leave. We plan on leaving Michigan in May of 2014 for our life on the road. Click on the blog tab above to follow our adventures. Thank you, M&M RV Trenton, MI. 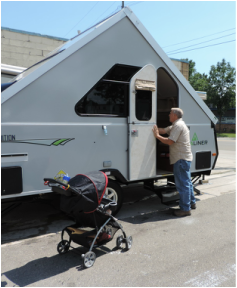 It really does take five minutes to set up the camper.